Day 231: Oh What a Night . . .
Yeah…we’ve been watching WAY too much news this week AND tonight. The Marathon Bombings, the Explosion in West, Texas and tonight, the finale to the manhunt as a result of the Marathon Bombing! NOT to be believed. The dealings of this week have been over the top and hard to bring back down to Earth!! Needless to say, it’s been a roller coaster ride without leaving the station. 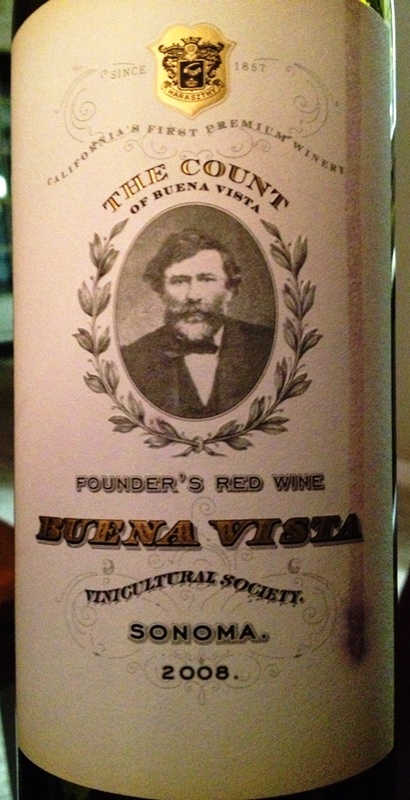 So we tried this wine out of the blue–Buena Vista from 2008–in Sonoma County. . .hey. it can’t be all bad if it a.) came from Sonoma and/or b.) tasted like a vintage wine years before!! the winery’s colorful founder, The Count of Buena Vista, pioneered premium wine making in California. A tireless and passionate devotee of California wine, The Count imported hundreds of premium vines from Europe, made Sonoma’s first wine caves, introduced innovative viticulture techniques, and wrote about California wine. Buena Vista Winery honors his legacy, bold vision, and commitment to excellence through this red wine – the Founder ’s Red Wine. The 2009 Founder ’s Red Wine is truly a wine that Count Haraszthy would be proud to have bear his name. Inviting aromas of ripe raspberries, cherries and blackberries lead to rewarding flavors of currant, blueberry jam and black pepper. This well-structured wine will please the palate with its lush mouth feel and lengthy finish. What we enjoyed was the peppery nose–along with notes of anise and black cherry, and there was a beautiful body to this wine that we hadn’t expected. We are constantly amazed by the men and women who are first responders. They know what their job is and do it to the best of their abilities..we often underestimate the role they play in dealing with situations like tonight. WOW!!! THANK YOU!! for all that you’ve done during the past several months! So, with a wine that costs less than $20 a bottle, you’ll be glad to raise your glass high and toast those closest to you! We tip our hats to the law enforcement members from the FBI, the Massachusetts State Police, the Boston Police, the Cambridge Police, the Watertown Police and so many LAW ABIDING citizens who paid attention and cared! Because of coordinated efforts, two really bad men are off the streets of our country FOR EVER. . .or it better be for ever! We hope that you’ll enjoy your favorite wine responsibly and remember to recycle whenever possible. Categories: Uncategorized | Tags: buena vista winery, red wine, Sonoma County | Permalink.